Warren R. Dawson FSA was a local antiquarian who lived in Simpson. 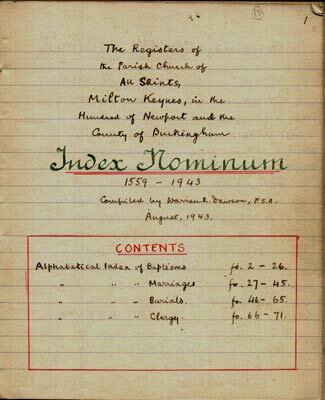 His interest in the locality led him to spend hours transcribing the church records of a number of the parishes now in the city of Milton Keynes. We have found his work invaluable when doing our own transcriptions, especially when the writing of our copies was difficult to decipher. He had the advantage of working directly from the originals. There was only one aspect of his transcriptions which was slightly unsatisfactory. He listed the partners in marriages separately using maiden names, so it is not easy to determine who married who!